Many patients come to us unhappy with the way their smile looks, and we are dedicated to helping patients conceal and correct smile flaws that impact their health, happiness, or lifestyle. 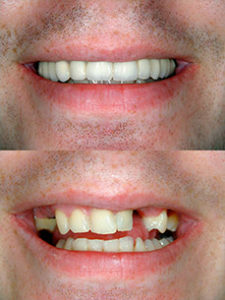 Every treatment plan is unique to the individual, but many patients choose porcelain veneers. Possibly the most versatile cosmetic dentistry service we offer, veneers allow patients to transform smiles in less time with a minimally invasive treatment option that delivers amazing results. Whether patients have chipped, cracked, unevenly spaced, or stained teeth, porcelain veneers renew smiles giving patients the healthy, beautiful smile they desire. Chips and wear caused by bruxism or aging making teeth look stubby, jagged, or uneven. Cracks and breaks in the tooth that may require extensive restorative dentistry to correct. This damage can be concealed and protected from further damage with a veneer. Deep-set dental discoloration that results from fluorosis, past root canal infection, tetracycline medications, and aging that may not be responsive to whitening. For patients who prefer not to undergo orthodontic treatment, crooked or gapped teeth can be concealed with veneers. Possibly the most appealing thing about veneers is the simple, painless placement process. Before we begin any cosmetic treatment, we invite patients to visit our office for a cosmetic dentistry consultation. During this initial appointment, the dentist examines teeth, takes x-rays, and uses digital imaging to evaluate smile irregularities. We discuss patients’ cosmetic goals, and preview possible results using digital images. Working closely with patients, we create a cosmetic dentistry plan that meets their goals, and if porcelain veneers are the best option, we schedule two visits to complete treatment. During the first treatment appointment, the dentist needs to remove a minimal amount of surface enamel so the veneer blends seamlessly into the patient’s smile line. Once teeth are prepared, we take impressions of the affected teeth and the whole bite that will be used by our trusted dental lab to create a custom veneer. Before patients leave, they are fitted with a temporary veneer that protects the prepared teeth, and allows them to get used to the look and feel of a veneer. When the custom veneer is completed, patients return to our South Miami dental practice to have their temporary veneer replaced with the custom restoration. The dentist carefully removes the temporary veneer, and places the high quality custom smile restoration using a dental cement commonly utilized in placing crowns, inlays, and onlays. Once the custom restoration is placed, patients enjoy brand new, stain resistant, durable smiles. If you’re unhappy with your smile, contact Aesthetic Dentistry of South Miami today. Dr. Barsky and his team are dedicated to helping patients achieve the picture perfect smiles they desire. Start the smile transformation process today with a cosmetic dentistry consultation.